Thailand has amazing diving off the coast and left me breathless! My scuba diving license is one of the best licenses that I have ever gotten. I became open water certified so that I can pursue underwater archaeology and with that experience, I fell in love with scuba diving. I spent the past two summers doing scientific diving so my experience recreational diving was limited to none. To expand my recreational diving I booked a trip in early December to Pattaya and one in April to Patong, Phuket to scuba dive. The scuba diving off the coast of Pattaya took me to the Gulf of Thailand where I dove on lots of coral and a shipwreck as well. The coral was really spread out and pretty. There were lots of animals that call the coral home: such as clown fish, angel fish, barracuda, eels, and more fish than I can name. The number of fish I can name is a little limited. The wreck dive, which was called Hardeep, showed us some blue spotted stingrays, eels, and lots of sea urchins. This was my first time doing recreational diving and I loved it. I was able to see lots of cool fish and coral, experience amazing visibility, and have a great time diving. I learned how to correct my diving because my form was a little off and I wasn't staying super straight in the water. Doing scientific diving before I thought I knew what to experience with the wreck but actually diving on a full wreck that had most of its pieces was so different and so much fun. This wreck wasn't the same as the wreck I have done with archaeology and I loved it. I was able to go inside the ship and see parts of where people lived, where some worked, where people ate, and where they went to relax. It was different than scientific diving because everything about the wreck was already known so I did not have to do research on the wreck; I just had to enjoy swimming through and around it to see everything it had to offer. After Pattaya, I didn't have time to go diving again until May when I took a trip down to Patong, Phuket before school started. 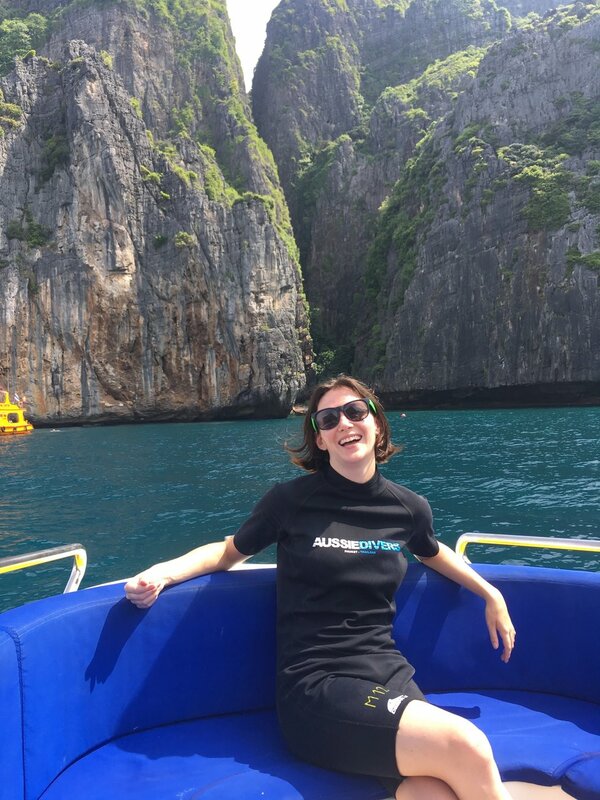 I went down to Phuket to go scuba diving off the Phi Phi Islands and let me tell you that this was some of the best diving I have done! Even though it was the off-season the diving was still breathtaking. The corals were full of bright colors and there were so many fish there that I swimming in a dream. I was swimming in schools of fish was absolutely worth every moment, clown fish, lobsters, sea turtles, and many more that I was living my "Finding Nemo" dreams. I was able to see the famous Phi Phi islands and eat lunch at the same beach in the movie "The Beach with Leonardo DiCaprio." The boat took us to the beach, Maya Bay, where we were able to swim in the Bay and eat lunch at the same time without having to deal with all the people on the beach. Diving around the Phi Phi islands was full of brightly colored corals and animals. After diving around the Phi Phi Islands we went to dive at Shark Point and even though I didn't see any sharks I saw some super cool corals and animals. The whole experience in Phuket was so much fun and colorful. There was wonderful diving from an amazing diving company and good company. I saw my first wild sea turtle, some breathtaking coral, and schools of fish. 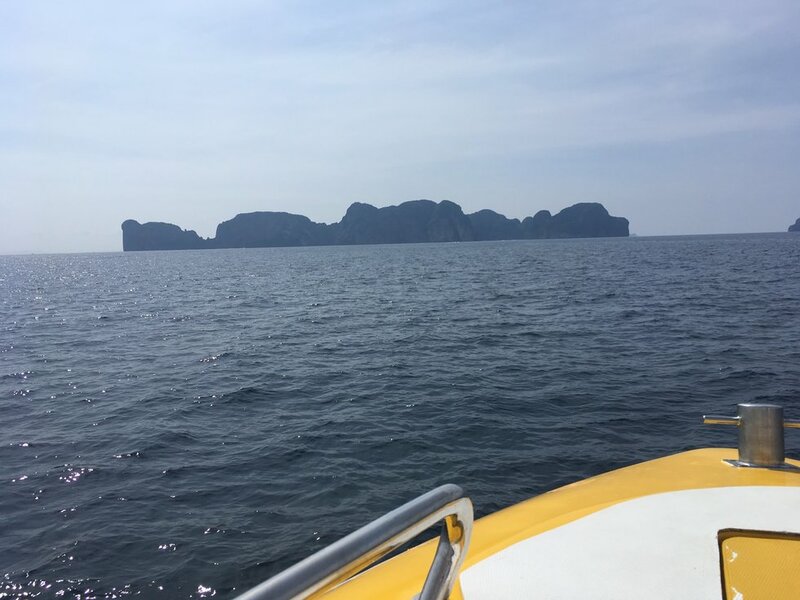 I can't wait to dive recreationally again both Pattaya and Phuket were everything I could have imagined and I cannot wait to see more of the ocean. In Phuket, I dove with Aussie Divers and I would 10/10 recommend this company. They put the clients first, taught us more about the fish we saw, had amazing food (I mean amazing food), and made the whole trip so much fun! This company is a company I would go to again and again.